Conference program posted on conference website. Shuttle service from Linares-Baeza train station to Úbeda. Registration desk will be open in UNED (Address: Gradas, 10, Úbeda) at 9.00 a.m. Opening Ceremony at 10.00 a.m. The deadline for submitting the abstract of any type of contribution is June 11th, 2017. This template uses standard LaTeX and we kindly ask you to use it and not any other format. Please, do not include commands involving page size, font selections, etc. Avoid using your own macros as much as possible. If you want to include figures in your abstract, please contact with the organizing committee (see the contact section). There will not be a formal refereeing process of abstracts. As a result, we expect that most of them will be accepted. If we do not let you know about the rejection of your contribution by Jun 18th, 2017, you may assume that it was accepted. You can check that your abstract was accepted or ask for an accepting letter by means of our on-line registration system. To be include in the scientific program, you must confirm your participation paying A)-Registration or B)-Accommodation-reservation before June 24th. A book of abstracts will be given to all attendees. 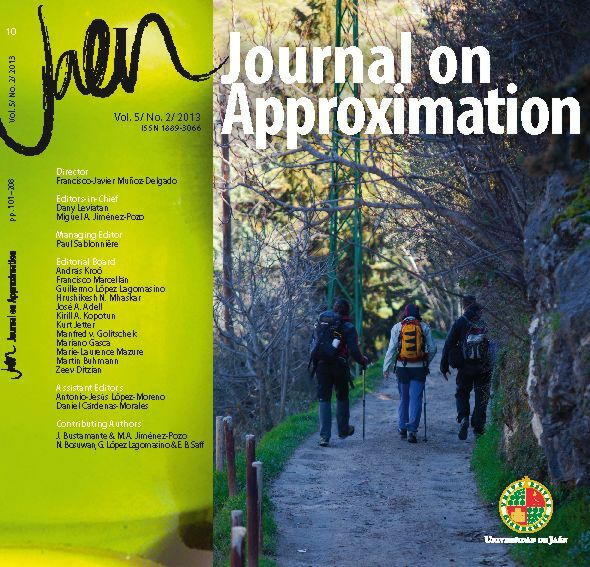 We will not prepare Proceedings of the Conference, but all the participants are invited to submit manuscripts (not necessarily about the subject of their talks) to the Jaen Journal on Approximation (please visit the web page of the Journal through the left-hand side menu). We very much appreciate your eventual submissions and we offer you reduced fees.